Corey Maggette. Corey is a simple case: Let him go. Maggette was the godsend from Savant NBA GM Michael Jordan in exchange for Ben Gordon's atrocious contract. Maggette found his way into the rotation early in the season, but those minutes quickly disappeared, and he failed to see the court after December 15. The trade of Gordon for Maggette was an unquestioned success: the Pistons dumped the league's worst contract in exchange for Maggette's expiring contract. Chalk this one up as a major win for Joe D.
Jason Maxiell. The longest-standing Detroit Piston will likely not be on the team next year, severing one of the final two connections to the Chauncy Billups-led Pistons. Maxiell's 2012 season saw his most significant minutes per game, as well as blocks per game. But with the acquisition of Tony Mitchell in the draft, it's likely Maxiell is gone. You only need so many high-energy rebounders coming off the bench, and it's worth rolling the dice with Mitchell rather than offering Maxiell another contract. Will Bynum. Bynum quietly had a productive season last year, driven primarily by his pick-and-roll play with Andre Drummond. Bynum charted the second-highest PER of his career (16.62), highest points per 40 minutes (20.9), highest true shooting percentage (53.2%), and second-highest assists per 40 minute (7.6). It was clear that Drummond and Bynum were most effective offensively when paired together, and given the importance of Drummond to this team's future, Bynum is an easy free agent to re-sign. Jose Calderon. Calderon is easily the most intriguing Detroit free agent. He was a valuable addition to a young Pistons team that needed veteran leadership. His presence allowed Brandon Knight to move to shooting guard, where he fits more naturally. However, Calderon has publicly stated that he's going to test the free agency market and will likely search for more money than he's worth to the Pistons. By drafting Kentavious Caldwell-Pope, Brandon Knight will resume his duty as the starting point guard, and by re-signing Bynum, Calderon's place on the team will be occupied. The Pistons will likely cut ties with Calderon, alleviating some of the roster constriction. That's a pretty full lineup. With only 15 roster spots available, the Pistons moves in free agency may be limited. That is, unless, the team makes some trades or doesn't sign all of their draft picks (the most likely candidate being Peyton Siva). Stuckey, Kravtzov, and English all have expiring contracts, of which only Stuckey's is particularly large, making all three of them valuable trade pieces. Expect one or all of them to be gone before the season begins. Following yet another disappointing season, new owner Tom Gores has said that the Pistons are in the market to spend. 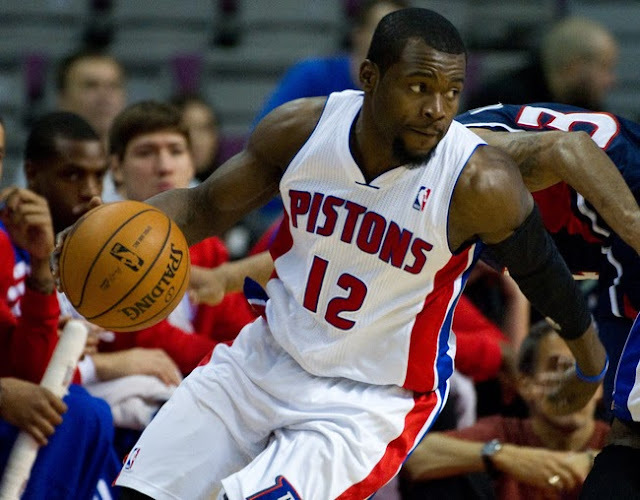 With a weak free agent class and and a laundry list of 2014 free agent stars (not to mention a draft class that will see teams trying to move into the first round), the Pistons find themselves in the same scenario that they did in 2009 when a max contract to Ben Gordon began the descent the Pistons are currently recovering from. The fear is that, looking to make an immediate splash, Gores pushes Joe Dumars to pursue and overpay a free agent this year rather than conserve their cap space for better players and better fits. Notably, the Pistons have been tied to JR Smith and Josh Smith in this year's free agency market, perhaps the two biggest names available apart from Chris Paul and Dwight Howard. Gores may push hard to acquire one of these two, neither of whom are very good fits for the Pistons organization. 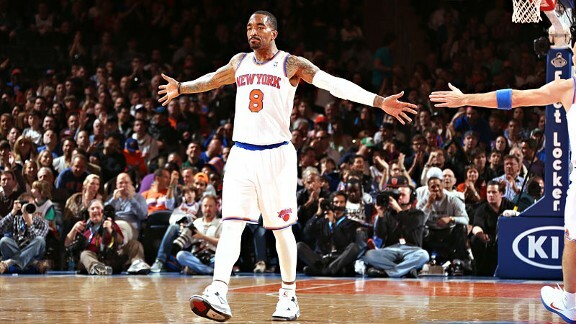 JR Smith is a cantankerous shooting guard known for limitless highs and more frequent lows. JR is coming off a career year with the Knicks and will likely garner major money from someone, but hopefully not the Pistons. Though he is still one of my favorite NBA players to watch and root for, his suspect defensive effort and skills paired with his up-and-down offensive game makes him a risky pickup for the Pistons. The other problem with JR is that he's going to demand a max or near-max contract. While JR is far more deserving of such a contract than Ben Gordon was, he would be a similar mistake. JR Smith is not a franchise player and would be either patchwork assistance or a hurdle in the rebuilding process. Josh Smith presents similar problems. A player that is known for his wishy-washy effort, Smith gets by on his unprecedented physical gifts. While pairing Smith with Greg Monroe and Andre Drummond would create the most imposing defensive frontcourt in the league, Smith would be antithetical to what the team is trying to do offensively: namely, run the offense through its two big men, neither of whom can stretch the floor very much. Smith would likely be pushed away from the basket as a jump shooter, the weakest part of his offensive game. There aren't many free agents in this class for the Pistons to pursue. However, I wouldn't be too disappointed if the Pistons made a run at a few players: Earl Clark, Kevin Martin, and Chris Copeland. Clark is an unrestricted free agent who played for the Lakers last season. He had his most productive season of his career and is going to test the free agency waters. The Lakers have a ton of money on the books still and may struggle to offer Clark the kind of money he desires. As long as the Pistons can get him relatively cheap, Clark may be a valuable addition to the lineup. I'm not sure that the Pistons can get him cheap, however. Kevin Martin is coming off of a disappointing season--at least in terms of how it ended--where he was supposed to recreate the magic that James Harden helped create in Oklahoma City. Martin lands on the free agent market after a season of ups and downs and may be slightly discounted, but there should be plenty of teams interested in his services, including Oklahoma City. And while Martin is a shooting guard by trade, his 6'7" frame would enable him to play small forward for the Pistons. It may be difficult to wrangle his services away from other suitors, but he would be a nice pickup for the Pistons. Finally, Copeland is a restricted free agent following his rookie season with the Knicks. As a offensive specialist, he may be a poor fit with this Pistons squad, but his offensive skills at the small forward position are exactly what the Pistons need. It's unclear exactly how much he believes he's worth, and as a restricted free agent, if the Knicks want to keep him, they're able to match any offer. But given New York's salary situation, it could be a tough sell to keep a rarely used small forward on that roster. Unfortunately, I expect the Pistons to sign someone in this free agency period and I think they'll probably overpay. There aren't any ideal fits this time around, and trading away expiring contracts is a better way to pick up a veteran without breaking the bank and staying viable for the '14 free agency market. The next few days will see a lot of action, as teams jostle for position in the 2014 lottery and shed contracts to get out of the luxury tax.